Hi guys, was planning to start flight spotting and clicking a few days back and posting them in a new topic of the above name. Now, I have started doing that with SpiceJet's induction of second Delhi flight. (If the name don't seem good, please suggest some in Suggestions to AAM topic). 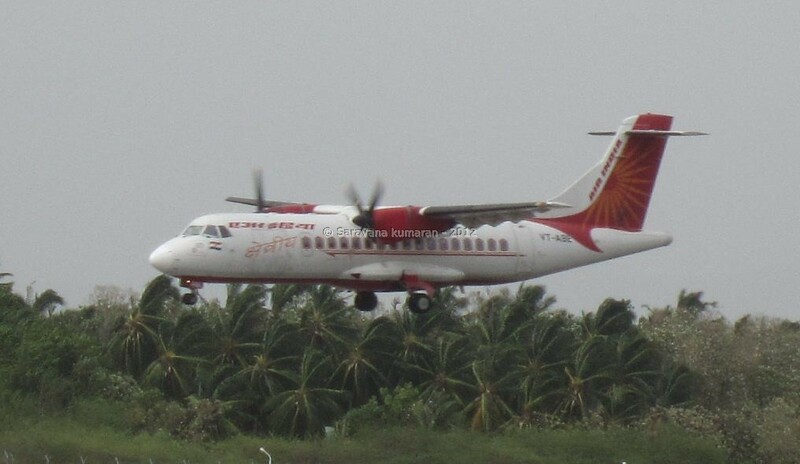 Share pictures of the flights that serve Madurai Airport in this thread (Adding flight number on the sides of the Aircraft will be very much appreciated). Here comes our new warrior The second Delhi flight to Madurai via Chennai (The SpiceJet buses were doing multiple trips from the Terminal to the Aircraft and they deployed another (not of SpiceJet) bus also). The new Delhi flight is also a hit. This route deploys the aircraft with code VT-SPQ. Guess some SpiceJet big head came to inaugurate in a Charter flight. See the flight code VT-LMW. We noticed another flight that stood for more than 1 hour (don't know till when it was there) and was as below (I don't know whether it is a 9W also because the flight was very very far so that I could not zoom very close and hence lost clarity). Standing nearby is the charter I posted above. Behind that is the blue color building which has industry type fans (updated by Madurai Gilli) whose size was okay to store inside a Q400 or ATR. I have some close pics also which I shall post in IXM topic for discussions on that. VT-SPQ was registered in India on 07-02-2011. It is a leased aircraft from Virgodell Limited, Ireland. Madurai/SSC has answered that it belongs to Coimbatore based Lakshmi Machine Works. Moreover the registration VT is the code allocated to India. All the aircraft registered in India starts with VT along with three other alphabets. TVS group has registered a embraer 500 in jan 2011. The aircraft parked at madurai also looks similar to an embraer 500.
so more chances that it could be a TVS aircraft. It seems like correct. I saw that aircraft 2-3 times standing at IXM. 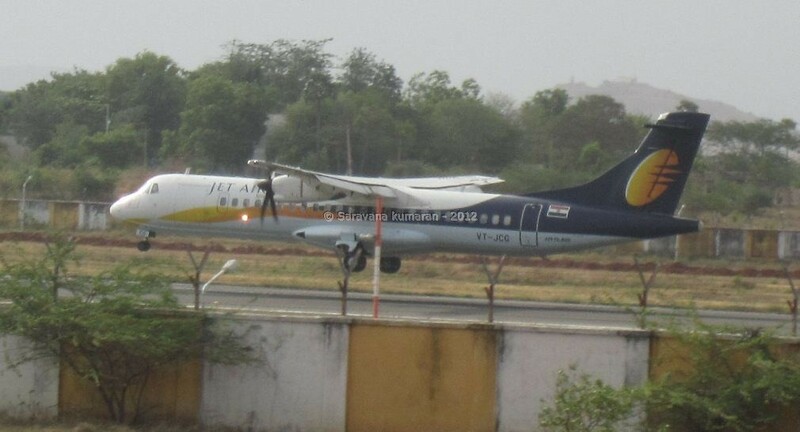 Jet Airways ATR 72-500 (Pictures Copyrights reserved by Madurai of SSC forum). TVS's Sundaram Fasteners Limited has a small chartered flight it seems and as below (Pictures Copyrights reserved by Madurai of SSC Forum). 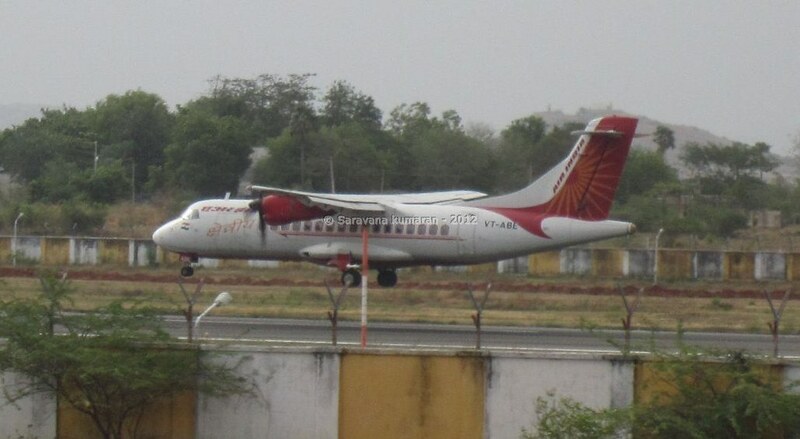 Today, Me and Sundar went to Madurai airport to spot the newly inducted IXM-COK ATR flight. Below are the pictures. The guy came 5 minutes late and cleared the place at 15 minutes late than scheduled time. It is time for the pictures. The 4.55 p.m 9W flight was also spotted today. to you and sundar sir buddy. Could find out any patronage?